No, that is not Humphrey Bogart peeking out of the clouds. It just looks like that because it’s Humphrey Bogart Pterodactyl, a mythical beast which just so happens to have a head that greatly resembles the erstwhile film star. If you’ve never heard of such a creature, that’s understandable. He did not exist until two weeks ago. OK, so hopefully everyone gets it now. 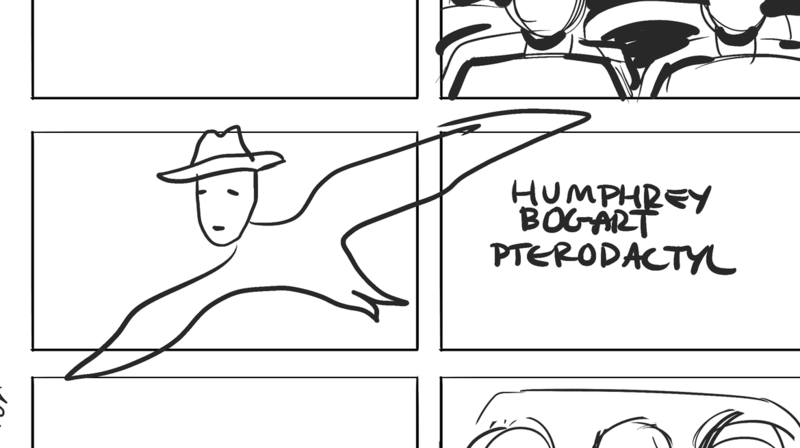 And just like that, with a few whimsical strokes of a Wacom stylus, Humphrey Bogart Pterodactyl was born. Humphrey Bogart Pterodactyl has flown into action because he is a highly skilled messenger, and we are in desperate need of his skills. For ten months now, we’ve been working really hard on some projects that we wanted to start talking to you about, but we had no way to do that. Why? Because you don’t know who we are, and we don’t know who you are. Even worse, you don’t even know that we don’t know who you are, because you don’t know who we are so you can’t know which things we do and don’t know. To say the least, that makes it extremely difficult for us to get the word out about our projects. And that’s a much bigger problem for us than you might think. See, if you don’t talk to people about who you are and what games you’re making, nobody will know or care about them, and then when you ship them, nobody will buy them. This failure will weigh heavily on you, you’ll become depressed, and eventually — perhaps not right away, but eventually — you may even turn to dangerous street drugs like marijuana, or as the kids today call it, “pot”. Once a game developer turns to a life of pot, they soon find themselves getting “high” every morning, shoveling off-label raisin bran into their mouths by the fistful, not even using common household implements like spoons. Their minds become so addled, they think grass is even more green than it actually is. They see the likeness of Old Man Eber in common objects which bear little or no resemblance. They listen enthusiastically to the latest rock musics. And finally, in the later stages, they find simple tasks like opening a combination lock so unreasonably hilarious that they are unable to accomplish them and must resort to laughing and cuddling with other game developers dressed in patterned shirts, the “street signal” that the other developer is also “high”. See? The danger is real. Sure, that video is a fictionalized account, but it was based on the real-life stories of actual game developers who bravely came forward and shared with university researchers what happened to them when they tried to ship games without first establishing a sophisticated public relations website. At Molly Rocket, we want to learn from the heartbreaking mistakes Scott Baio so bravely portrayed. We want to create a safe space where we can talk about our games every week, and communicate with you, the gaming public, about what we’re doing and why. And we felt that there could be no greater ambassador, no more fitting symbol, no more sultry a liason for this purpose than the great Humphrey Bogart Pterodactyl. Now armed with the facts, you surely agree. So here it is! Our brand new website. Starting today, we will update it every Monday morning with a new post about what we’re working on and how our projects are coming. If you follow Anna or I on Twitter, you’ll probably see us tweet about it when it goes up, but we’ve also set up a mailing list for folks who want to get each post delivered to them directly. You can subscribe using the handy footer on this page! Since this is the first time you’ve ever seen Humphrey Bogart Pterodactyl’s head peeking out from behind the clouds, you can’t be expected to know the gravity of the situation that gesture portends. 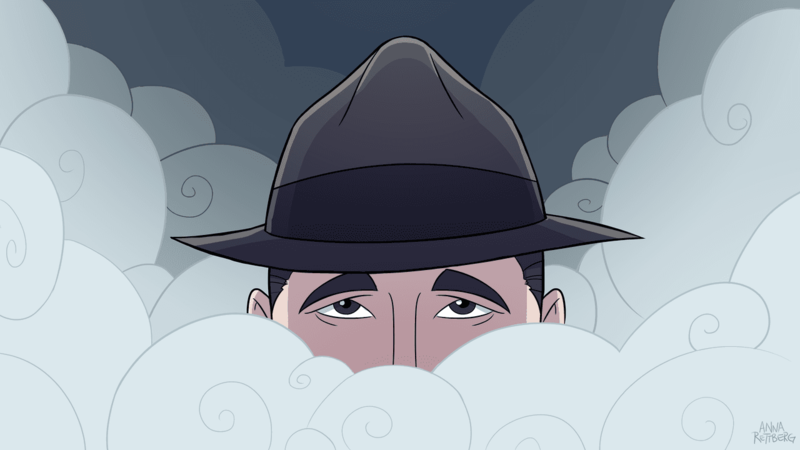 But as you will see over the coming months, when a Molly Rocket Monday update features a Humphrey Bogart Pterodactyl head peek, it means the following week’s post will be a major announcement of some kind. And today is no different. Because the head is peeking, if it’s a major announcement you are seeking, there’s no need for tweaking, and barring any leaking, in just seven short days we’ll be speaking all about a big upcoming Molly Rocket event right here on this blog!